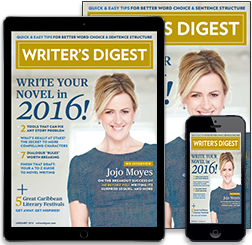 Subscribe to the #1 Magazine for Both Aspiring and Working Writers since 1920! 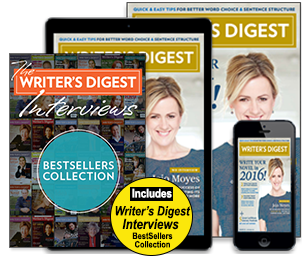 Subscribe now and get a FREE gift – The Writer's Digest Interviews: Bestsellers — some of the best interviews in recent history with the bestsellers who've built devout readerships beyond most writers' wildest dreams. 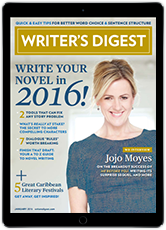 Canada and Foreign All-Access and Print Only subscription: Canada add $10.00. Foreign add $12.00. SUBSCRIBERS' AUTOMATIC RENEWAL FEATURE: I understand that I will receive uninterrupted service and delivery of my magazine and that my subscription will be automatically renewed each year at the rate then in effect. I won't be bothered with any renewal notices in the mail; instead, I will receive a clearly marked annual reminder 6 weeks before my credit card is charged. 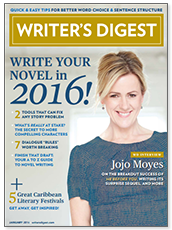 I may cancel at any time during my subscription and receive a refund on any unmailed issues by calling 1-800-333-0133 (U.S.), 1-386-246-3372 (Int'l).